Visit one of our inflatable dome stargazing sessions and we will show you how to find your way around the night sky. You will find out how to spot the constellations that dominate the sky in different seasons. And, of course, how to identify the brightest and the most famous stars. Like the the North Star! Although the North Star is only the 50th brightest star on the night sky, it is very easy to find. 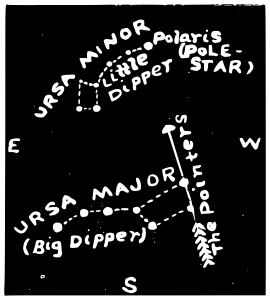 Just follow the two pointer stars, Dubhe and Merak, in the scoop of the Big Dipper in the constellation of the Big Bear and here it is, the North Star. Or Polaris. In fact, the “North Star” is a title, rather than a proper name. Yes, our current North Star is Alpha Ursae Minoris, the brightest star in the constellation of the Little Bear. But a very long time ago a different star used to sit in this position. For example, between 4000 BC and 2000 BC Thuban in the constellation of Draco the Dragon used to point to the North. In the distant future yet another star will take its place. The term “North Star”refers to the position of a star near the Earth’s celestial North Pole, the imaginary point in the sky where the axis of the Earth’s rotation “pokes” the celestial sphere. As the Earth spins on its axis all the other stars seem to circle around the Polaris. Strictly speaking, the North Star is not precisely positioned at the North celestial pole. It is less than 1 degree off-course. Therefore it traces a tiny circle around the Celestial North Pole too! Still, at the moment it is the closest star to the celestial North Pole. Therefore its position gives us a pretty accurate idea of the directions on the celestial sphere. 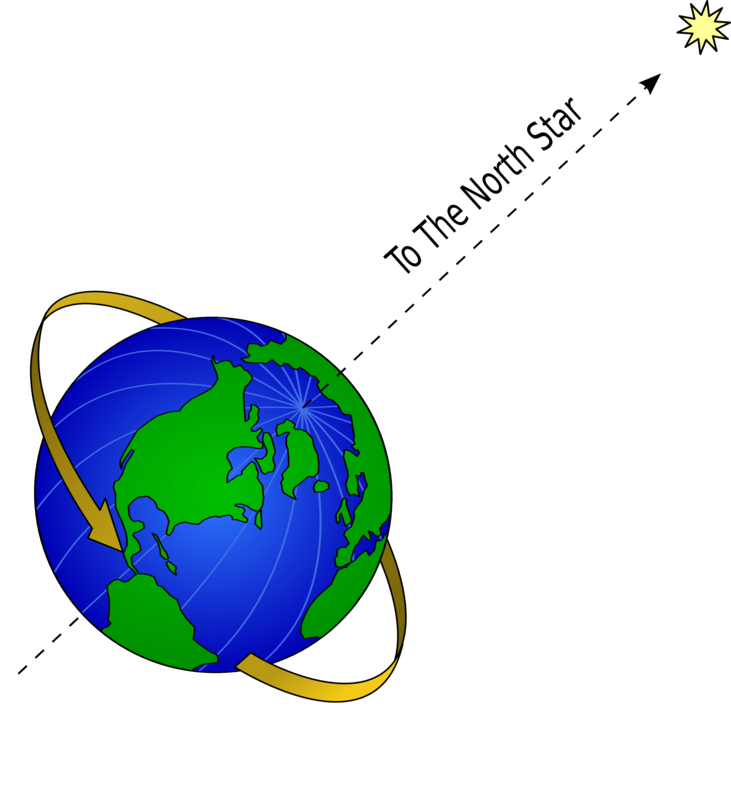 The reason why different stars become “North star” over time (and we mean thousands of years here) is that the orientation of the axis of the Earth’s rotation changes over time. A phenomenon, called precession, causes the axis to rotate and “trace” a cone in space (or we can say the the celestial Poles trace circles) with a period of 26 000 years. Another phenomenon, called nutation, complicates the matters even further by causing the rotating axis to wobble! Not pretty! At the moment, when we say the North Star we refer to the bright star in the tip of the Little Bear’s tail situated 433 light years away from the Earth. But what our eyes see as one star is in fact a multiple star system consisting of three components! When the 18th century astronomers pointed their telescopes to Polaris (the discovery is usually attributed to William Herschel) they noticed two stars, the yellow supergiant Polaris A and the small star Polaris B. Further studies of the supergiant A revealed a dwarf companion star (now we call it Polaris Ab) orbiting around the supergiant (Polaris Aa). Some astronomers argue that B star is just a background object and that A and B components are not physically associated. The most interesting star in the North Star trio is Polaris Aa. Aa is not your average star. It is a Cepheid variable, a “pulsating” star that periodically changes its brightness. Cepheids are extremely important for astronomers because they help us measure space distances! Polaris Aa is our nearest Cepheid. So scientists try to learn as much as possible about it in order to understand more about Cepheids in general. Recently astronomers noticed that Polaris Aa behaves strangely. The amplitude of the star’s pulsations used to decrease in the last century, but now it is increasing again! Looks like there is still a lot to learn! Any questions? Let our inflatable dome team know!